Enhances skin’s clarity, while promoting elasticity. Antioxidant capsules are formulated with 10% vitamin C in the form of L-Ascorbic Acid. They will enhance skin clarity and promote its elasticity. Regular use will help diminish signs of aging, leaving the skin looking healthier and more radiant. A powerful antioxidant known to stimulate collagen synthesis, diminish signs of aging and help protect against UV damage. Apply the sunscreen first, then one Antioxidant capsule. Twist open one capsule and put the content in the palm of your hand. Apply onto the 5 points of the face (forehead, each cheek, nose and chin). 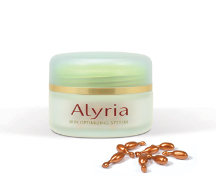 Once product is absorbed into the skin, if necessary, follow with your Alyria moisturizer. Cyclomethicone, Ascorbic Acid, Dimethiconol, Dimethicone Crosspolymer, C12-15 Alkyl Benzoate, Tocopheryl Acetate, Methyl Methacrylate / Glycol Dimethacrylate Crosspolymer, BHT.